Think of the bail out bag as a supplementary bag of tricks that might help in an extended shooting, prolonged perimeter position, or any incident that would require immediate action without time to return to the patrol car for more gear. For example, let’s say you were dispatched to a pair of active shooters in a high school. When you arrive, you have your pistol with two extra magazines, a back-up gun, and a shotgun or carbine to carry into the fight. Your shotgun probably has four rounds plus five more in a side saddle (if so equipped), while your carbine may have one extra magazine. Sounds like a lot of firepower until you get several minutes into the battle and realize you are burning ammo faster than you could have imagined. If you had a bail out bag, you could have extra shotgun ammo or a couple of extra carbine and pistol mags. You could also have some first aid gear, such as a clotting agent and trauma pads in case you or your partners take rounds. The 5.11 Bail Out Bag offers some very nice features for less than $50. Maybe the active shooter scenario seems a little extreme. Try this example. A drive by shooting happens in your jurisdiction and a witness gives you a valid tag # and vehicle description. A check of the DMV database yields the registered owner’s address with a physical description that matches your suspect. You and other officers respond to the house and set up a perimeter. Your position requires you to stand in the summer sun for two or three hours before the suspect finally agrees to come out. Your bail out bag containing a bottle of water and a granola bar would help keep you refreshed, and maybe keep you from suffering from heat exhaustion. So, what kind of bag is good for a bail out bag? This is highly dependent on you. You have to find something that is comfortable, works with your normal duty gear, and holds what you need it to. 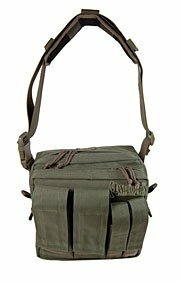 5.11 makes a bag called the Bail Out Bag which is set up with pouches for six AR magazines plus other compartments. 5.11 also makes the Push Pack, which is slightly smaller than the Bail Out Bag, but may be easier to use for some people. MAXPEDITION also makes several bags that would work well as bail out bags. 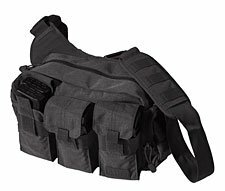 Just released is the Active Shooter bag (pictured above) that comes in models with magazine pouches on the front or with MOLLE-type webbing for a custom set up. I also like the Jumbo Versipack, but there are smaller and larger packs available depending on your needs. chalk, grease pencil, or marker for marking doors of rooms searched, etc. The fact of the matter is your bag can contain anything that might make your job easier in unusual circumstances. You know your area, and what will work for you. Here in Florida, I am unlikely to need any of the small chemical handwarmers. Up in Maine or Michigan, you might want to include them (at least in the winter months). Please chime in and add your own suggestions on what kind of bag you like, and what you carry in your bag.